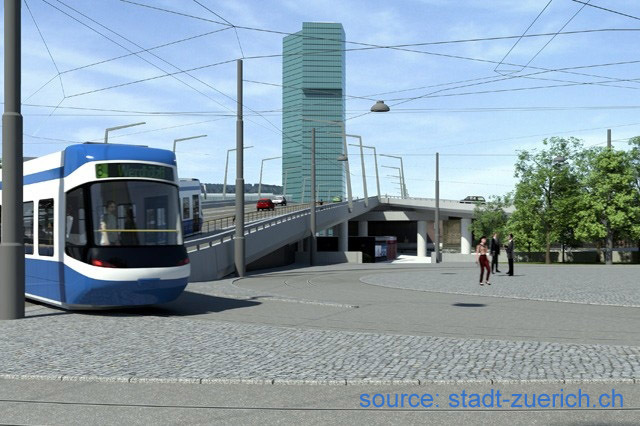 On 20th March, the city council gave its final approval to the Hardbrücke tram project (extending route 8 from its present terminus at Hardplatz using the road overpass to re-join existing tram tracks at Schiffbau, from where route 8 will continue to Werdhölzli. The new tram infrastructure will cost 100 million CHF, of which the city will pay 11.4. At the same time the Hardbrücke S-Bahn station will be remodelled to improve passenger circulation and integrate the new tram service. This will cost 30 million CHF. The station is currently used by 44,000 people per day, and this is expected to increase to 80,000 to 90,000 as the area develops further. This news item is from the 2013 newslog.